Founded in 1991 by Sogyal Rinpoche and located near Montpellier in southern France, Lerab Ling is Rigpa's international retreat centre and home to the Rigpa Shedra West, and includes the newly constructed temple Palri Pema Ösel Dargyé Ling, also known as The Institute of Wisdom and Compassion. The site was chosen on the advice of Dilgo Khyentse Rinpoche. 1991 - 3rd and 4th August, Dodrupchen Rinpoche visited the site and blessed the land. He gave the name 'Ratna Ganga' to the stream. 1992 - The first three month retreat (108 days) retreat was held, led by Sogyal Rinpoche. Dzogchen Rinpoche, Dzongsar Khyentse Rinpoche, Garje Khamtrul Rinpoche and Ringu Tulku Rinpoche also gave teachings. 1993 - The second three month retreat led by Sogyal Rinpoche saw visits from Khenpo Jikmé Puntsok, Thich Nhat Hanh and Arnaud Desjardins. 1994 - Three retreats are held during the summer, with visits from Nyoshul Khen Rinpoche, Dzogchen Rinpoche and Ringu Tulku Rinpoche. 1995 - Three retreats are held again, led by Sogyal Rinpoche, with the Dzogchen retreat in August featuring a visit from Kyabjé Penor Rinpoche who gave the empowerments of the Nyingtik Yabshyi. Dzogchen Rinpoche, Ringu Tulku Rinpoche and Khenpo Namdrol also attended. 1996 - The summer saw visits from Nyoshul Khen Rinpoche, Khandro Tsering Chödrön, Dzongsar Khyentse Rinpoche, who gave an elaborate empowerment of Chimé Pakmé Nyingtik, Neten Chokling Rinpoche and Orgyen Tobgyal Rinpoche. 1997 - The three months of the summer began with a visit from Dzigar Kongtrul Rinpoche, and saw visits from Khenpo Petse, who taught Mipham Rinpoche's commentary on the Guhyagarbha Tantra, Dzogchen Rinpoche, who gave an empowerment of Nyenpo Lha Sum, Neten Chokling Rinpoche and Orgyen Tobgyal Rinpoche who led a Vajrakilaya drupchö, Tulku Pegyal Rinpoche who taught on phowa and Ringu Tulku Rinpoche who began his series of teachings on the Bodhicharyavatara. 1998 - Once again the summer retreats were led by Sogyal Rinpoche and featured a visit from Neten Chokling Rinpoche and Orgyen Tobgyal Rinpoche. In addition, Sherab Özer Rinpoche travelled from Kalzang Monastery in Tibet, and performed an enthronement ceremony for Sogyal Rinpoche, Dzongsar Khyentse Rinpoche gave teachings on the practice of Rigdzin Düpa, and there were also teachings from Chökyi Nyima Rinpoche and Tsoknyi Rinpoche. Dzogchen Rinpoche also attended and Dr Trogawa Rinpoche paid a brief visit. 1999 - The theme of the three month summer retreat was ngöndro, which Sogyal Rinpoche taught from an experiential perspective. Neten Chokling Rinpoche and Orgyen Tobgyal Rinpoche led a Vajrakilaya drupchö. Orgyen Tobgyal Rinpoche gave teachings on dzogrim. Tsoknyi Rinpoche taught on View, Meditation and Action as part of the meditation retreat. Dzogchen Rinpoche taught on the Kunzang Lama'i Shalung Zindri by Khenpo Ngakchung. In November, Sogyal Rinpoche led an older students’ retreat and Kyabjé Trulshik Rinpoche came and gave a series of empowerments, including Vajrakilaya Yang Nying Pudri, to over 500 older students. 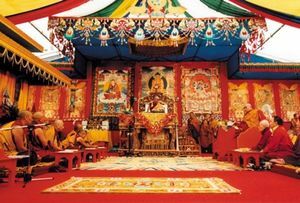 2000 - The visit of His Holiness the Dalai Lama, preceded by a Vajrakilaya drupchen by the monks of Namgyal Monastery and Garje Khamtrul Rinpoche. Kyabjé Trulshik Rinpoche was also present. See Lerab Gar 2000. 2001 - The first Rigpa Shedra took place with teachings from Dzigar Kongtrul Rinpoche and Ringu Tulku Rinpoche. Dzogchen Rinpoche gave the empowerment of Rigdzin Düpa, Namkha Drimé Rinpoche gave an empowerment of Gesar, and Orgyen Tobgyal Rinpoche taught on the practice of Narak Kong Shak. 2002 - The second year of the Rigpa Shedra saw teachings by Ringu Tulku Rinpoche on Chegom Khorloma, Steven Goodman on Abhidharma and Dzigar Kongtrul Rinpoche on the Uttaratantra Shastra. Mingyur Rinpoche visited for the first time, there was a Kurukulla drupchen led by Neten Chokling Rinpoche and Orgyen Tobgyal Rinpoche, who taught on tsok practice, and there was an instructor retreat led by Tsoknyi Rinpoche. 2003 - In Kyabjé Trulshik Rinpoche came to give the empowerments of Döjo Bumzang. Mingyur Rinpoche taught during the Meditation Retreat, Tsoknyi Rinpoche continued his guidance of Rigpa instructors, Khenpo Namdrol began his teachings on Dodrupchen Jikmé Tenpé Nyima's commentary on the Guhyagarbha Tantra. Neten Chokling Rinpoche and Orgyen Tobgyal Rinpoche led a Lama Norlha drupchen, and Alak Zenkar Rinpoche visited in September. 2004 - Orgyen Tobgyal Rinpoche and the monks of Chokling Monastery led a drupchen of Tukdrup Barché Kunsel, Khenpo Namdrol continued his teachings on the Guhyagarbha Tantra. 2005 - Khenpo Namdrol continued his teachings on the Guhyagarbha Tantra, Dzigar Kongtrul Rinpoche came to speak as part of his book tour, and the shedra returned to Lerab Ling after two years in Dzogchen Beara and featured teachings by Ringu Tulku Rinpoche on the Madhyamakalankara and by Khenpo Jampal Dorje on the Abhisamayalankara. In December, Kyabjé Trulshik Rinpoche came and gave a series of empowerments including the Nyingtik Yabshyi, the first major event to be held in the newly constructed temple. 2006 - Khenpo Namdrol concluded his teachings on the Guhyagarbha Tantra. The summer saw visits from Professor Samdhong Rinpoche, who gave talks on the Dalai Lama's philosophy of non-violence and the three levels of spiritual capacity, Orgyen Tobgyal Rinpoche, Lodi Gyari Rinpoche and the Nechung Oracle. The 'All Mandala' retreat was attended by more than two thousand students. 9 August: beginning of Rigpa's first three-year retreat led by Sogyal Rinpoche. The 'First Teaching Period' of this retreat focused on retreat advice and the preliminary practices (ngöndro) of the Longchen Nyingtik. Dzigar Kongtrul Rinpoche also taught on the Seven Points of Mind Training. 5 December: Khandro Tsering Chödrön arrives and takes residence at Lerab Ling. 2007 - The 'Second Teaching Period' focused on the study of the Bodhicharyavatara, chapters 1-8, and the practice of sadhana, with extensive teachings on Rigdzin Düpa and Yang Nying Pudri. His Holiness Sakya Trizin gave the empowerment of Vajrakilaya from the Khön family lineage and Dzigar Kongtrul Rinpoche taught on Jigme Lingpa's Staircase to Akanishtha. There were also visits from Dr Lodrö Puntsok and Khenpo Puntsok Namgyal, as well as Alak Zenkar Rinpoche, Pewar Rinpoche and Tsoknyi Rinpoche. 2008 - The 'Third Teaching Period' focused on Dzogchen, with teachings from Sogyal Rinpoche, Chökyi Nyima Rinpoche, Mingyur Rinpoche and Tsoknyi Rinpoche. Dzigar Kongtrul Rinpoche taught on the Heart Treasure of the Saints. The 'All Mandala' retreat with three attendance options culminated with the visit of His Holiness the Dalai Lama and also included teachings from Shechen Rabjam Rinpoche, Father Laurence Freeman, Orgyen Tobgyal Rinpoche and Pewar Rinpoche, and an empowerment from Taklung Tsetrul Rinpoche. 22 August: His Holiness the Dalai Lama formally inaugurates the Palri Pema Ösel Dargyé Ling temple of Lerab Ling in the company of Carla Bruni-Sarkozy and consecrates the main Buddha statue through an elaborate rabné ceremony. Jetsün Kushok Chimey Luding visits in October and grants lung, wang and tri for the practice of White Tara Wishfulfilling Wheel. April: Visit from Sera Jé geshes and monks. Tibetan dances and chants. 21 November: Official end of the first three-year retreat. 2010: Orgyen Tobgyal Rinpoche leads a Tukdrup Barche Kunsel drupchen. Khyentse Yangsi Rinpoche visits Lerab Ling for the first time, accompanied by Shechen Rabjam Rinpoche and Ven. Matthieu Ricard. Jetsün Khandro Rinpoche, Khenchen Pema Sherab, Dzigar Kongtrul Rinpoche and Yangsi Kalu Rinpoche all visit during the year. Almost one thousand people attend the Third International Forum on Buddhism and Medicine, entitled Meditation and Health, which is held in the temple. 2011: At the end of May, Khandro Tsering Chödrön, who has lived at Lerab Ling since 2006, passes away. The dung chö ceremonies take place on 2 September, presided over by HH Sakya Trizin. Also present are HE Ratna Vajra Rinpoche and HE Gyana Vajra Rinpoche, HH Sakya Trizin’s wife Gyalyum Chenmo-la, Dzongsar Khyentse Rinpoche, Alak Zenkar Rinpoche, Jigme Khyentse Rinpoche, Pema Wangyal Rinpoche, Rangdrol Rinpoche, Khenchen Sherab Gyaltsen Amipa Rinpoche, Sogyal Rinpoche, Orgyen Tobgyal Rinpoche and other eminent lamas and monks. Dzogchen Rinpoche, Ringu Tulku Rinpoche, Dzigar Kongtrul Rinpoche and Dzogchen Pönlop Rinpoche also visit during the summer. 2012: Lerab Ling celebrates its twentieth anniversary. Dzigar Kongtrul Rinpoche, Professor Samdhong Rinpoche, Phakchok Rinpoche, Khenchen Pema Sherab, Orgyen Tobgyal Rinpoche and Chagdud Khadro are all invited to teach during the summer months. The temple at Lerab Ling, given the name Palri Pema Osal Dargye Ling by Trulshik Rinpoche, was inaugurated by His Holiness the Dalai Lama on August 22nd, 2008. 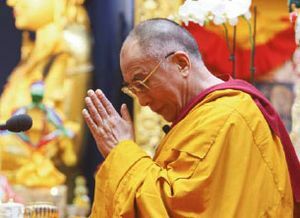 "In whatever way we choose to see it—as a representation of Tibetan culture, a home for Tibetan Buddhism, a centre from which to offer the Buddha's teachings far and wide, or a place of pilgrimage for generations to come—we have built this temple because it is, we believe, one of the greatest contributions we can make towards bringing wisdom, compassion and peace into the world. "In many places today, people are recognizing that spiritual development is not a luxury, but a sheer necessity for our survival. Witness the almost desperate hunger and need everywhere for spiritual vision, and for the tools to negotiate the challenges of life, find happiness and understand and transform the mind. 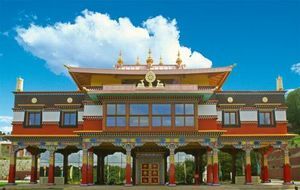 This is why the very existence of spiritual centres like Lerab Ling has now assumed truly vital importance, because it is on the accessibility of spiritual teachings and the building of a spiritual culture that the very future of humanity depends. "This temple is for Tibet, and it is for the world." This page was last edited on 14 September 2018, at 08:52.